By Iain Larmour, web science writer. In aqueous solutions metal ions can promote acidity via the hydrolysis reaction. This is measured by a hydrolysis constant, which has previously been correlated to the ratio of the ion’s charge to size. Unfortunately lead and tin stubbornly refuse to fit this correlation; additional factors must be at work. Anthony Stace and team investigated further by studying the minimum number of water molecules needed to stabilise a dication complex in the gas phase against spontaneous hydrolysis (called Coulomb fission in the gas phase). 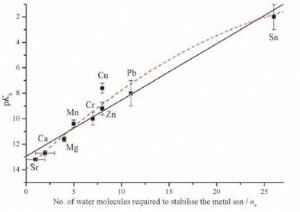 They found an extraordinarily good correlation between the number of water molecules required and the metal ion’s hydrolysis constant in aqueous solution. What about those stubborn dications, lead and tin? They fit within the trend, requiring a surprising 11 and 26 water molecules to stabilise them respectively. This work suggests that Lewis acidity of metal ions is determined, in part, by the requirement that the ions remain fully solvated. Plot of acidity constant against minimum number of water molecules required to stabilise the complex against Coulomb fission. To find out more, download the ChemComm article today.